WHEN Margie Lowe pulled her daughter from the pool, she thought she was pulling out a dead baby. In the short time it took her husband Justin to pick up a few palm fronds, 15-month-old Annalee managed to leave his sight and walk straight into the pool area. Moments later Justin was running to the pool and his wife was screaming as she pulled their daughter, who was lying face down, out of the water. "When I pulled her out I thought I had pulled out a dead baby," Margie said. Justin was quick to react and started performing CPR on Annalee while Margie called 000. The Maryborough dad didn't ever think he would have to use his CPR training on his own child and urged other parents to have up-to-date training under their belt. "You don't ever think you will have to do CPR on your own kid," Justin said. "It crossed my mind that this may be the end," he said. Their older son had 'monkey climbed' up the gate to open it and Annalee followed him into the fenced area. "The hardest thing was to see him (husband) bring Annalee back," Margie said. "If it wasn't for him I don't know what I would have done. "The doctors can't believe we have a walking, talking baby out of this," she said. Margie said they were a lucky family to have their baby and have since zip tied areas of the pool fence and have covered the pool. 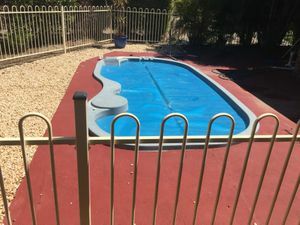 "We will probably never use the pool again," Margie said. Queensland Ambulance Service Acting Officer in Charge at Maryborough Station, Darrell Searle said with the school holiday season in full swing, it was vital at least one parent had up-to-date CPR. "It's not only pools, but dams and waterways," Mr Searle said. Mr Searle stressed that due to the quick actions of the father, CPR saved the life of this baby. "It is also important children are supervised at all times," he said.